Last Christmas I was gifted a body butter by a well-known handmade company. And I was absolutely blown away by just how fluffy this stuff was. I’m talking chocolate mousse, whipped cream or puffy cloud fluffy. It was that amazing. 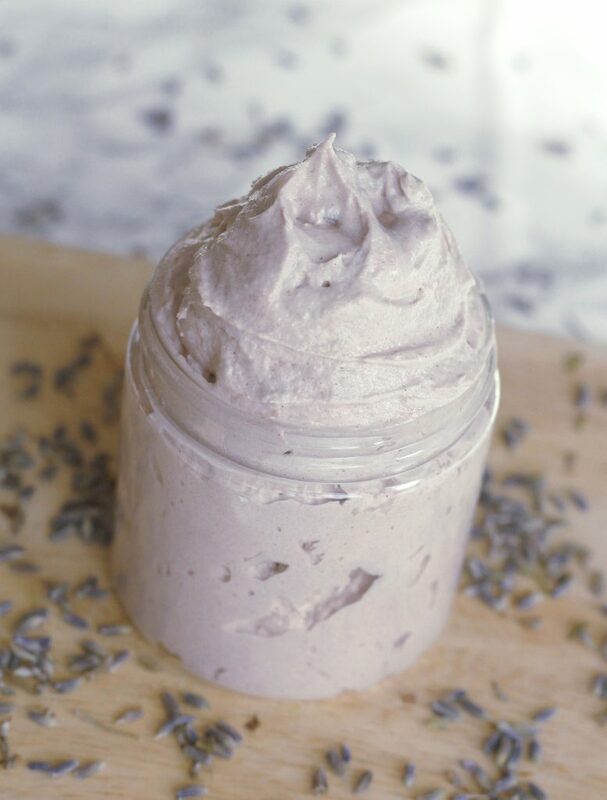 Sure I had been making my own whipped body butters for a while and they came out fine – somewhat light, somewhat spreadable – but they never had that level of fluffy airiness. So I went back to the drawing board to examine my recipe and technique. First I changed up the ingredients – mainly, I ditched the coconut oil. Coconut oil is great and all, but for my specific goal (remember: mousse consistency) it was simply too heavy and weighing down my precious air bubbles. Next I had to shake up my technique. What had I been doing so far? Well, throw everything in a heat safe container, melt it over low heat, stick it back in the fridge until almost solid, and whip it up. That was it. After an extensive internet search and some experimenting I settled on this new and improved method: I melt the shea butter over low heat and let it cool down to room temperature (I don’t know why, but this seems to make the whipping part easier) I then whip only the shea butter and slowly, little by little add the melted cocoa butter and oil. I am not sure why this gives me a better result but it does. 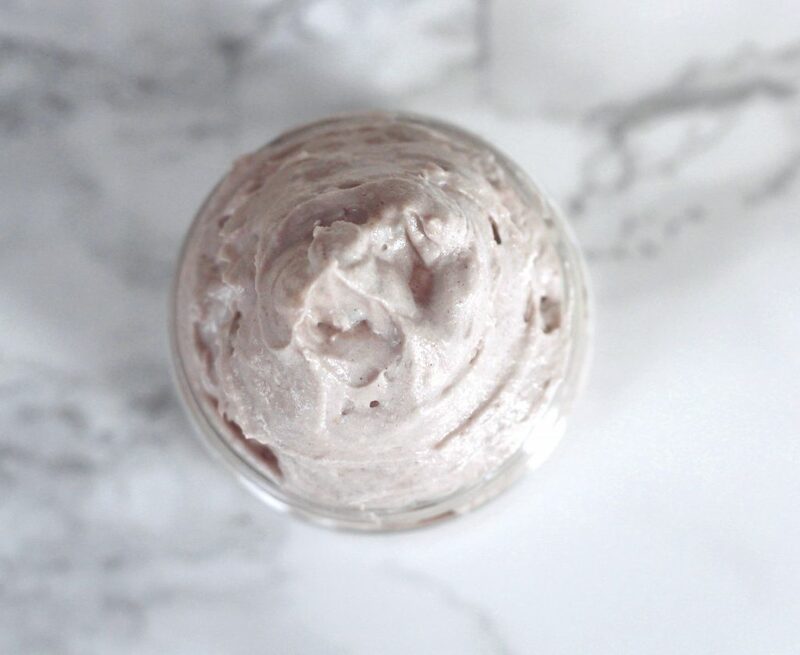 Shea butter is one of the greasier butters, but I wanted to use it in this recipe because of some of it’s skin benefits (namely: good for eczema). To offset the grease factor I use tapioca starch which seems to do the trick. I imagine cornstarch would work too. I like to start with melting my shea butter first on very low heat and then putting it in the fridge. This seems a little counter intuitive – why the extra work? I find that getting the body butter to a nice fluffy consistency depends heavily on temperature similar to when you make whipped cream. It’s easier to get the cream to a whipped state when it’s nice and cool. Putting the she butter in the fridge allows for the container to be cool enough and the shea butter to be still soft enough, so that I have more success getting it to a mousse consistency. This is especially useful when you’re doing this in a hot climate. You might even want to put your container in an ice bath while you’re working. Note: I have modified the instructions slightly from the original post to accommodate crafters that live in warmer climates as well. Little by little add your melted cocoa butter mixture, thoroughly whipping with a mixer after each addition. You really want to add as little as possible each time, if you add too much at once you could end up with a puddle. 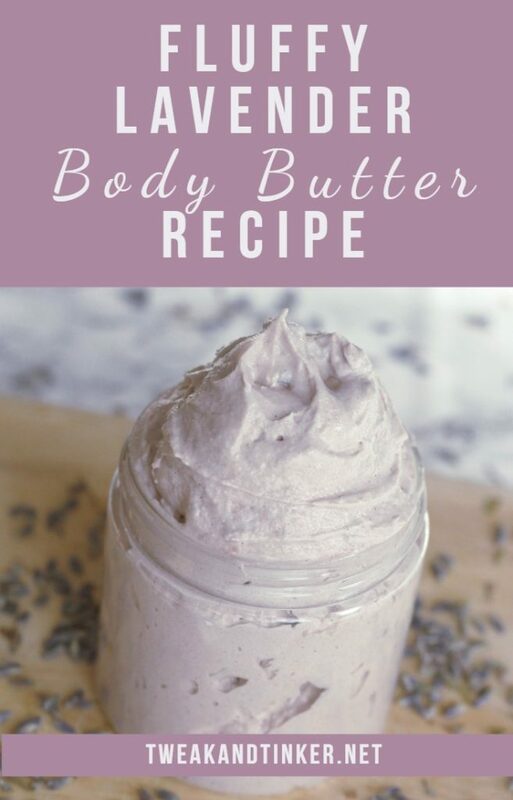 What’s your go to method for making super fluffy body butter? Freshly whipped – it will get fluffier after it sits for a while. 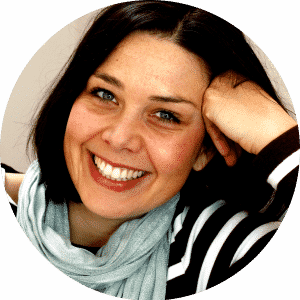 Personally I love reading Humblebee and Me, Modern Soapmaking and I find Soap Queen helpful too. Good Luck! Step 2 the shea butter gets hard; in Step 6 I’m directed to start beating it. Do I need to soften it up before I beat it? That’s a good question. The shea butter has to be room temperature in order for it to get nice and fluffy otherwise you’re left with a more gloppy consistency. I even like my shea butter to by just a little chilled. Technically you could leave out the step of melting and cooling the shea butter again. I like to do that, because I find it’s easier to whip that way since you have a nice smooth surface instead of a bunch of clumps. Can’t wait to try this! What’s the shelf life. Do you reds preservative thanks! Hi Paula, good question. The shelf life is determined by the oil or butter with the shortest shelf life. In this case it’s most likely the hemp seed oil which typically has a shelf life of 6 months. To be absolutely sure check the expiration date on your supplies and take it from there. Body butter doesn’t contain any water so you won’t need a preservative. HI Nancy, good question and no you didn’t miss it 😉 I forgot to put it in there, my bad. This recipe will make about 24 oz of finished product. So, if you’re using a 4 oz jar you would need six of those. Happy Tinkering! Followed instructions exactly and just have soup!! Is there anyway this can be saved? You can absolutely save this badge. Put the whole thing in your fridge. When the sides start to set up a fair bit, take it out and whip it up. It probably won’t be as fluffy, but it will still be light and spreadable. Remember to then keep your finished product in a cool place. Hi Celine, Do you have to worry about bacteria or mold? Do you disinfect your equipment. Hi Debbie, good question. I do desinfect my equipment with 99% rubbing alcohol. However, there’s no water in this product. That’s why I didn’t add a preservative. But you could if you’re worried it could get in contact with water, I recommend Optiphen. This body butter has a shelf life of about 6 months, depending on how fresh your oils and butters are. Overtime those will go rancid. Even a preservative can’t prevent that. What you can do to extend the shelf like is add a little vitamin e oil to your body butter before whipping it up. I melted the Shea butter (100% shea) and let it cool for several hours but it never got hard again. All still very liquid. What’s that about? Hi Deb, did you try putting it in the fridge? Sometimes in the summer room temperatures can be too warm. Remember to store your finished body butter in a cool place, if you live in a hot climate. Thabks for sharing this. I have a question when mixing in the cocoa butter.. do I whip as I add the cocoa butter or just add the cocoa butter and mix using say a spatula? I tried the recipe but the Shea butter smell is so unpleasant that I could not stand next it.. I added 20drps lavender essential oil, 10 drops of sweet orange oil, 20 drops calendula oil and still could not get rid of the Shea butter smell can you please help in explaining how did u manange. M making a baby body butter n I want to smell good..
Hi Krisztina, I used refined Shea butter and didn’t have an issue with the smell. Unrefined Shea butter however can have a smoky odor that can be unpleasant. Unfortunately, there’s nothing you can do to get rid of the odor if you bought the unrefined type. Hi! I wanted to use Sweet Almond Oil in place of the jojoba oil, would that work? yes, I imagine it would work. I just bought hempseed oil..I doubt I dump the whole thing in there…how many drops?? Hi Tracie, for a fairly large batch you’ll need 2 oz. But you can easily split the recipe in half. Do you use refined shea butter and refined cocoa butter? Also, can you use food coloring or mica powder in replacement of the clay to add color? Thanks! I use refined shea butter simply because I can’t stand the smoky scent of the unrefined one. 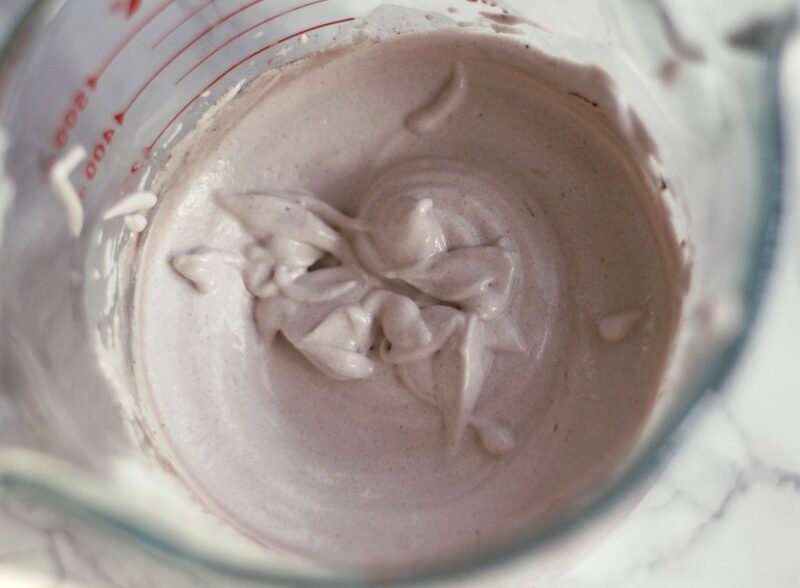 Unrefined cocoa butter could work, but your body butter will have a slight chocolat-y scent to it. Mica definitely works, if you use food coloring use gel based food coloring. You don’t want to introduce anything that contains water or you will have to add a preservative.